1. Earrings – Martine Wester £45. 2. Necklace – New Look (Price TBC). 3. Ring – Accessorize £15. 4. Earrings – Dorothy Perkins £10. 5. Necklace – Accessorize £15. 6. Ring – Evans £8.50. 7. Necklace – Forever21 £10.65. I‘ve fallen in love with turquoise jewellery. Taylor Swift was seen at the Peoples Choice Awards last week, wearing a stunning Ralph Lauren grecian-style dress with a pair of huge ‘Pat-Butcher-Sized’ turquoise earrings and the pairing was so simple but so elegant and just screamed summer! This is the look i’ll be going for once that sunshine kicks in…obviously not in red carpet worthy ralph lauren but I’ll do my best. 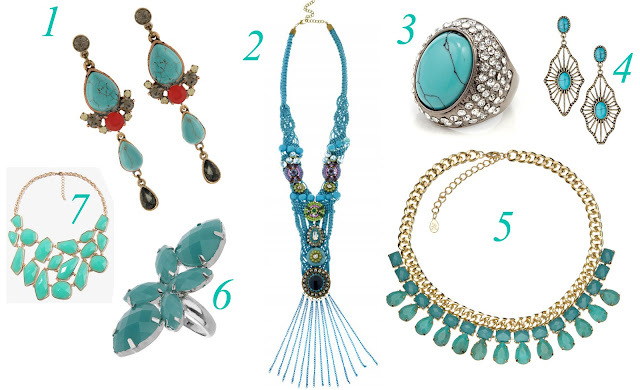 So just for a bit of summer inspiration here’s a few of my favourite turquoise jewels out for SS13.